I tend to walk and talk on my phone a lot. 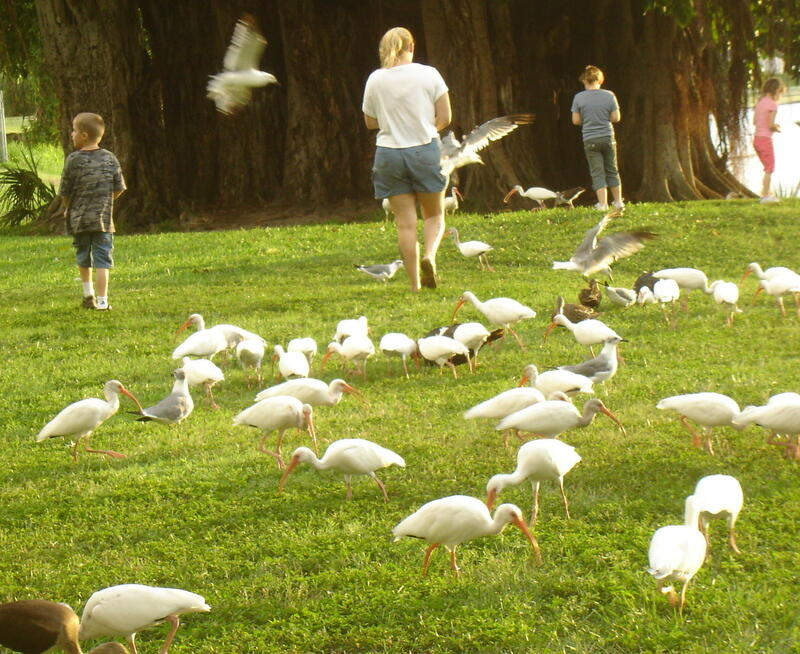 Sometimes, I walk around a lake near downtown St. Pete and just watch families feed ducks, middle-aged women power walking, or younger people walking their dogs. It’s a great place to people watch, and I always find myself imagining different stories about the people I see. There’s the old guy who I saw aimlessly walking around the lake with a big smile on his face, and then the group of high school cross-country boys who stampede through the park, shirtless and hairy. About five of these boys have long blond hair, which flops in their face with each step they take. I guess they’re not big fans of hair elastics. They often come charging toward me, their footsteps pounding behind me, getting closer, closer, closer, creating a beaten path. I’m afraid they’ll run me over, like the time I was walking home from school and a boy twice my size came charging toward me on his bicycle. I used to walk to and from school and would read as I walked. (I suppose I’ve just always liked multitasking while walking.) I was about to cross a four-way intersection, when all of a sudden, I felt a huge bang against my back. My book went flying in the air, the clarinet case I had been carrying flew into the intersection, and I fell to the ground. I looked up and saw the kid who had practically ridden over me, bicycling down the hill. He hadn’t even stopped to say sorry! It was my first encounter with a hit-and-run. The crossing guard rushed over to me and called the police, who took me on my first ride in a police car. They asked me some questions then drove me home, front door service and all. Naturally, when my mom opened the front door to our house and saw the police car, her eyes widened and she started asking what went wrong. One of the first things she noticed was my tattered clothing. The cranberry-colored spandex pants I had been wearing were decorated with a gaping hole in the knee. Forget the scratch on the clarinet case, or the tire marks on my book — my spandex pants were ruined, and my mom wasn’t feeling it. She wrote a letter to the school and demanded that Danny pay for a new pair of spandex. Danny never got in trouble, I think because he may have had a disability that caused him to act irrationally. I was too young at the time, though, to point fingers or know why he did what he did. A couple weeks after the hit-and-bike as I’ll call it, the school secretary called me to the main office and handed me an envelope with a crumpled $10 bill inside. No apologies, just cash. The cash seemed so valueless. My mom’s insistence that Danny pay me reminded me of a similar instance involving a girl named Katie who used to sit next to me on the bus. One day, we were comparing slap bracelets. She had a white one with red delicious apples imprinted on it, while I had a sparkly silver one. I was always a glitter girl. Why have just plain crayons or glue when you can have glitter crayons or glitter glue? As a teenager, I wondered, “Why wear plain blue eyeshadow when I can wear blue eyeshadow with glitter? The glitter always got in my eyes, but it made them sparkle … literally. Anyhow, Katie and I used to play with our slap bracelets on the bus, and then one day, she just decided that glitter was cooler than red delicious apples, so she took my slap bracelet and wouldn’t give it back. The nerve! My mom called her mom and asked her if her daughter could give me back my bracelet. Leave it to my mom to settle these types of matters. The next day, my wrist was nicely decorated again with a silvery strip. But that wasn’t the end of it. Katie used to take lots of my things, especially my pencils. When I would ask her why she was using my pencils, she would say, “My mom bought these for me at Fiske’s,” referring to our town’s general store. Sure. She had the same answer when I asked her why she was using the pencil I bought on a field trip to Sturbridge Village. Sure. The pencil had “Sturbridge Village” plastered all over it. She wasn’t quite as amusing as the “pencil picker-upper,” though. I used to sit across from a boy named Ben. One day while learning third-grade math, I dropped my pencil and was soon amazed by the speed at which Ben reached down to pick up my pencil. “Here you go,” he said, chuckling. He would play with his pencils and often stick them between his two front teeth. My mom used to call him “Bucky Bucky Beaver.” Intrigued by his impressive pencil retrieving skills, I dropped my pencil again, and Ben quickly swept it off the floor. But alas, his smooth moves didn’t sweep me off my feet. Often throughout the rest of the school year, I would drop my pencil and see how quickly Ben would pick it up for me. It was kind of a game we had, though I don’t know how much Ben enjoyed it. I was too busy staring across the room at a boy named Chris. One afternoon, when we were putting our chair on our desk (yes, the kinds of chairs with big huge tennis balls on the bottom to prevent the chairs from making noise when sliding across the floor), my classmate Travis walked up to me and whispered, “Mallary, Chris thinks you’re a cutie pie.” A cutie pie?! I thought. Wow, a cutie pie sounded so much better than just plain old “cute,” or “funny,” or “nice.” “Cutie” is better than “cute” because it has two additional letters tacked on to the end of it, and pies are, well, tasty and sweet. Nothing could be better than calling someone a cutie pie, I reasoned. On Valentine’s Day, my mom and I rode our bikes to the local CVS and walked through the candy aisle to try to find a valentine for Chris. My mom finally picked one out for me, even though I thought it was a little too daring. It was a big chocolate heart that had a face and was driving a red car. Above the heart, the words “You drive me crazy” appeared. I stuck the valentine in Chris’ mailbox but signed it from “your secret admirer.” So cliche, but so fitting for a third-grader. What would he say when he saw the valentine? Would he eat the heart or savor it for years to come? What if he doesn’t eat chocolate? Would he figure out that I had been his admirer? I never found out the answers to these questions because I hardly talked to him after that. The cutie pie comment drew me to him, but scared me away, too. I don’t know if my cranberry-colored spandex are still sitting in a Good Will somewhere in Massachusetts, or if my sliver slap bracelet is still slapping. I don’t know if Katie has a stash of “pencils she bought at Fiske’s” buried somewhere in a desk drawer, and I haven’t heard from Ben or Chris in years. Though these things and people are missing from my day-to-day life, their stories are never hard to find. Their stories exist in memory, ingrained in time and ready to be retrieved. Sometimes writing about these stories keep them alive, ensuring their longevity long after we die. Often, where memories fail, writing speaks. So when I observe something in the present day, I try to think about what it makes me think of — longing, childhood, fear of the future, laughter, solitude. Soon enough, by the time I’m done with my walk, I’ve sketched a labyrinth of stories for myself, one that tangles me up in time but also sets me free. I enjoyed your experiment–known in the literary world, of course, as stream of consciousness. You are a wonderful journalist, but you also have a creative streak as well. Keep reading books on that list you made, and don’t forget to take time to craft a short story once in a while, too!